All our products are sold for display purposes only. If buyer buy and uses for any activity other than display purposes, buyer assumes all risk and responsibilities that may result from misuse of product. Read all enclosed information. Caution: The blade of this sword is extremely sharp and may cause serious injury. Make sure that the blade edge is never in a position where it could injure yourself or others. Never clean or oil the blade with the edge towards you and avoid touching the edge at all times. Never draw or sheath the sword with the edge towards you. Never allow children to handle the sword. This product is intended for use by those 18 years of age or older. Read all instructions before using. The purchaser and user should conform to all laws governing use and ownership of this product. Whether encased in shirasayas (wooden scab¬bards & hilts) or koshirae (formal mountings), all swords need to be kept in their sword bags. The kojiri (head of the scabbard) must be inserted into the bag first to prevent the possibility of dropping the blade into the bag while holding the saya (scab¬bard). 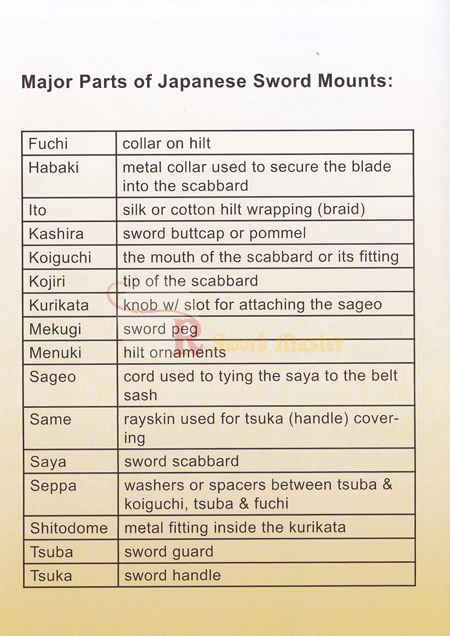 When carrying/holding a sword, be sure that the tsuka (hilt) is positioned higher than the saya (scab¬bard). 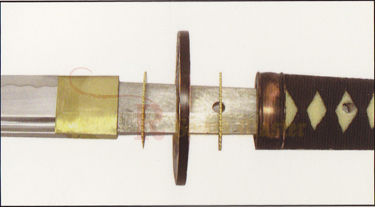 This measure will prevent dangerous accidents such as the possibility of the blade falling out of the scabbard. 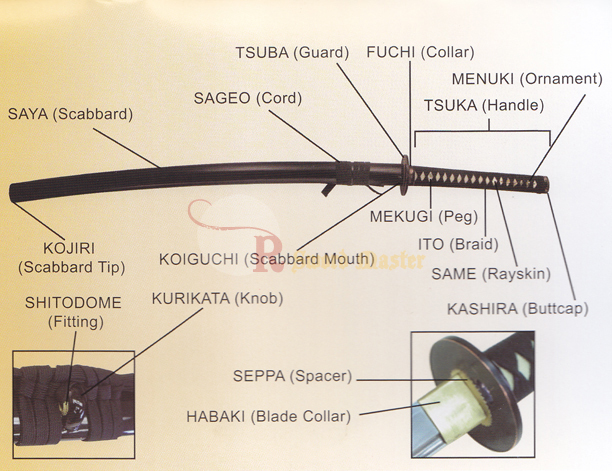 Whenever one draws the sword out of its bag or scabbard, make sure the position of the tsuka (hilt) does not go lower than the says (scabbard). To avoid accidental unsheathing, the blade is deliberately made to fit firmly into the saya (scab-bard), Never unsheathe the blade by simply pulling the handle and the scabbard apart! A sudden powerful pull may not only impair the Koiguchi (scabbard mouth), but also result in an uncontrollable jerk that can lead to injury. Use your left thumb and push the tsuba (guard) away from the mouth of the scabbard. 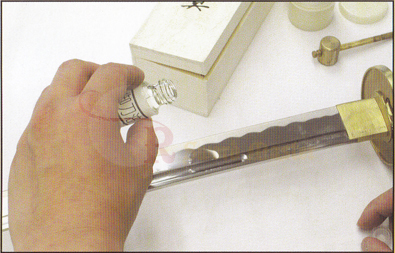 Gently slide the blade from the scabba d when the friction resistance is broken. Be sure the back of the blade, not the edge, contacts the scabbard during the Wthdrawal. This will prevent dulling the blade and cutting the scabbard. When placing the blade back into the scabbard, hold the hilt in the right hand, edge up, and the scabbard by the wrapped section with the left hand, Make sure the scabbard is curving in the same direction as the blade. Gently place the tip of the blade into the mouth of the saya (scabbard) and carefully slide the blade and scabbard together. 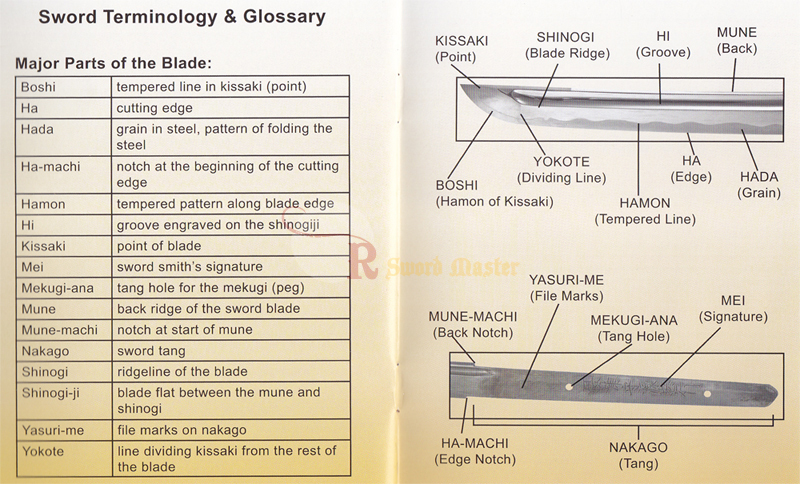 Again, make sure that the back of the blade and not the edge is in contact with the scabbard. When the habaki (blade collar) reaches the opening of the saya (scabbard), resistance will be felt. A slightly firm push is necessary to fully seat the blade. 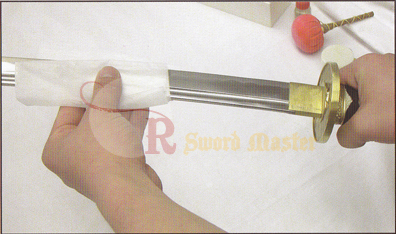 The major purpose of proper sword maintenance is to make sure the steel surface does not oxidize or rust. It is necessary to thoroughly remove the stale oil and replace it entirely with new oil. 1) Mekugi-nuki: a small brass hammer and awl combination tool to remove the mekugi (bamboo peg) holding the blade & handle together. (This tool is a traditional part of the maintenance kit. However, we strongly recommend against disassembly of the sword since the bamboo pegs will wear, resulting in a loose grip. If you must remove the handle, make sure you have new bamboo pegs to replace). 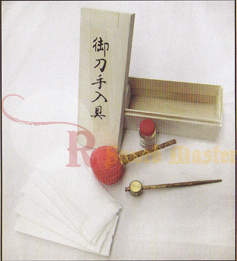 2) Rice paper for cleaning oil from the blade, polishing, and spreading oil on the blade. 3) Uchiko: the most finely ground whetstone powder (30-35gram) for cleaning the blade surface. It is wrapped in Japanese hand-made paper called yoshino-gami, then rewrapped by cotton or silk cloth. It comes through the wrapping materials when patted on the blade surface. 4) Bottle of choji oil, to prevent rusting. Scabbard Maintenance: The scabbard of your sword is finished in many coats of lacquer. In order to preserve the shine, the scabbard needs only to be wiped occasionally with a very soft cloth. 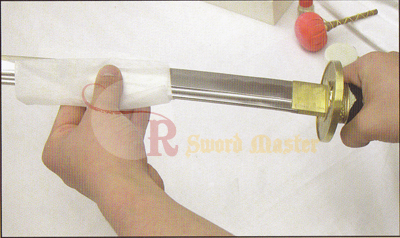 In addition, only handle the scabbard by holding the wrapped section. Otherwise, fine scratches caused by handling the lacquered sections will dull the finish. Blade Maintenance: Make sure the edge of the blade is away from you and work very carefully to avoid injury. First use a sheet of rice paper to remove the oil from previous maintenance. Starting at the base of the blade, place the cleaning paper on the mune (back of the blade) and fold it into halves toward the edge. Lightly grip the paper-covered blade with your thumb and forefinger to wipe the blade upward only. When expertise is attained, the wiping action can also be both ways, up and down. Lack of experience could cause the cutting of paper or even fingers and thus it must be strictly avoided. Be particularly careful in wiping when you reach the tip of the blade. In case the oil cannot be removed with ease, cotton or gauze soaked in benzene or pure alcohol may be used in the same wiping manner. Once the oil is removed, use the uchiko (powder ball) and tap it lightly along the length of the blade. (When using the ball for the first time, you may need to tap the ball against the blade a few times to "start" the powder flow through the fabric of the ball). Next, use a clean piece of rice paper to carefully rub over the powder to polish the blade. Repeat until both sides of the blade have been polished and the oil/powder is removed. Do not inhale the powder. Apply a few drops of oil along the length of each side of the blade. Then use a new piece of rice paper or clean cotton cloth to spread the oil evenly over the blade. The oil must be spread thinly and evenly so that no excess oil will overflow and harm the scabbard. Make sure not to touch the blade again before re-sheathing. Always store your sword horizontally with the ha (edge) up. This prevents the oil to go down along the blade surface and make a pool at the kissaki (point). Furthermore, this prevents the dege from bearing on the scabbard and preserves the condition of both. Caution: The blade of this sword is extremely sharp and may cause serious injury. Make sure that the blade edge is never in a position where it could injure yourself or others. If you need to handle the blade, be extremely careful and wear protective gloves. 2. Once you removed both bamboo pegs, grasp the handle with the left hand and hold the sword in an upright position. Make sure to keep the cutting edge away from the body. Then use your right hand to hit your left wrist lightly to loosen the hilt. Be careful not to hit the left wrist too hard with the right hand as there is a danger that blades with short tangs might bounce out of the hilt entirely. 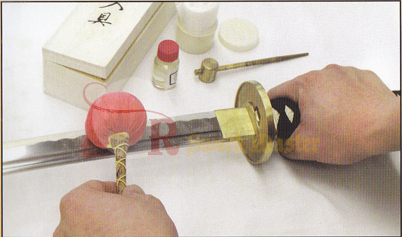 Note: You might need to use a rubber mallet and tap lightly on the tsuba if the handle is siezed to the tang. Be sure to wrap the tsuba with a cloth towel to protect it. 1. With the bare blade, slide the habaki (blade collar) onto the tang until it fits tightly against the mune-machi and ha-machi notches. 2. Next, slide the seppa (washer), then tsuba (guard), then the second seppa (washer), and finally the tsuka (handle) onto the tang. 3. 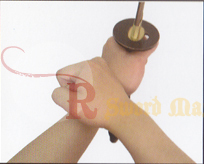 Grasp the handle with the left hand and hold the sword in an upright position. Make sure to keep the cutting edge away from the body. Tap the end of the handle upward with your right palm until it is firmly tighten together. Note: You might need to use a rubber mallet to ensure a tight fit. Be sure to wrap the handle with a cloth towel to protect the kashira. 4. Insert the 2 mekugi (pegs) to secure the tsuka to the blade.